From pregnancy tests to “I’m going to be a big brother” T-shirts, celebrities always find creative ways to tell the world about their baby news. Whether the announcement be on social media or in public, we can expect a less than average reveal. “Glee” star Naya Rivera recently confirmed her pregnancy through a pretty adorable Instagram post, where she flaunted her blossoming belly in a bathing suit. Although she revealed an inkling of baby news on her website in February, and there was some evidence of a potential bun in the oven when she was honeymooning with husband Ryan Dorsey in April, Rivera is finally flaunting her pregnancy. Her glowing skin and “summer accessory” in her new photo displays that she is in fact adding to the family. As if Blake Lively and Ryan Reynolds weren’t already the most beautiful, perfect, genetically-ideal couple we’ve ever seen, they decided to stop the world with their baby news. Blake Lively announced her pregnancy on her lifestyle website, Preserve, where she wrote a post about celebrating expecting mothers. Lively announced her pregnancy on her lifestyle website, Preserve, where she wrote a post about celebrating expecting mothers. She added a beautiful photo of her growing baby bump to the piece, showing the world she is one of those mothers now. In the spirit of celebration for her fourth wedding anniversary, Alicia Keys did a cute photoshoot with her husband Swizz Beatz showing off her beautiful baby bump. It’s only appropriate that the Grammy winner posted the news to Instagram. Alicia Keys welcomed baby number two with husband Swizz Beatz by doing a family photoshoot and posting it to Instagram. What better way to show your excitement for an addition to the family than to get a head start on family portraits? Even though it’s their second child, Keys shows she is just as joyous as the first time. Tamera Mowry put a cute twist on a pretty stereotypical post in order to make her pregnancy announcement creative and special. She posed for an Instagram picture with her positive pregnancy test to tell the world she was expecting baby number two. 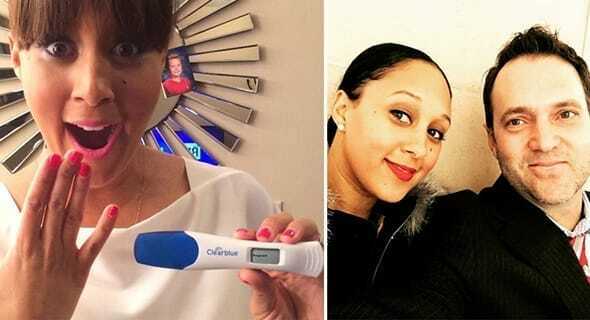 Mowry posed for an Instagram picture with her positive pregnancy test to tell the world she was expecting baby number two with husband Adam Housley. The “Sister, Sister” star made an adorable facial expression to show her excitement and even wrote a cute caption about how her Clearblue pregnancy stick helped her out. She and husband Adam Housley are due to celebrate in July 2015. 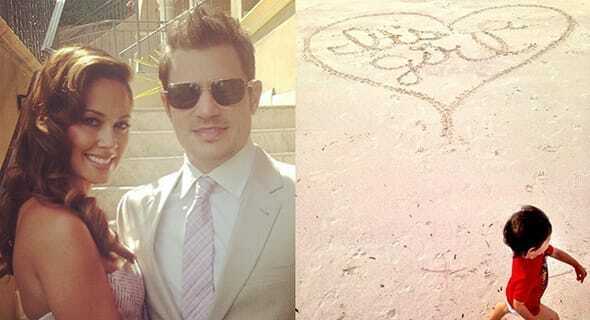 If you thought Nick Lachey and Jessica Simpson were perfect for each other, you can guess again. Lachey and his wife Vanessa Minillo celebrated three years of marriage in July 2014 with the cutest pregnancy post on Instagram. Lachey and his wife Vanessa Minillo celebrated three years of marriage in July 2014 with a cute post on Instagram saying they were expecting a girl. The photo of their first son running on the beach was adorable in itself, and to top it off, there was a heart at the top with “It’s a girl” written inside of it. What a loving, playful way to show the world they were ready for a brand new baby girl! We all cried a little bit inside when Stacy Keibler and George Clooney split, let’s be real here — but we couldn’t be happier for her and husband Jared Pobre. They secretly tied the knot, AND secretly (kind of) announced Keibler’s pregnancy. Keibler took a photo of a bun inside of an oven, captioned it, “Look what we’ve got cooking!” and posted it on Instagram. How clever! 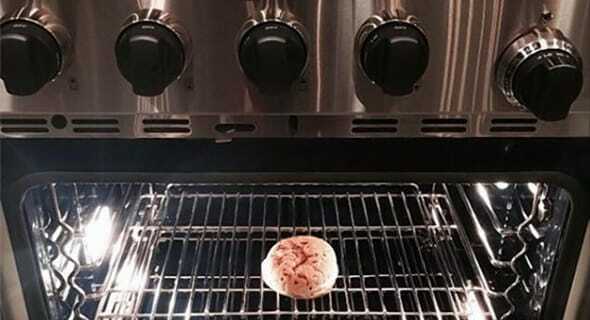 In a clever March 2014 Instagram post, Keibler took a photo of a bun inside of an oven and captioned it, “Look what we’ve got cooking!” Not everyone can be that funny and unique when revealing baby news. “American Idol” sweetheart Carrie Underwood had another great example of an original, cutesy Instagram post when announcing her baby news. She used her two dogs, Ace and Penny, to help her tell everyone their family was about to grow by one. 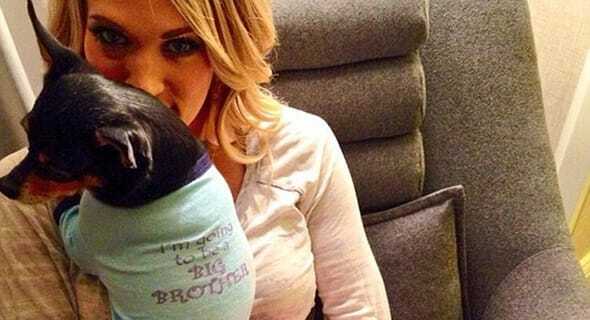 Ironically on Labor Day, she and husband Mike Fisher dressed their furry friends in matching “big sister” and “big brother” outfits to humorously tell the world they were expecting their first child. Could they be any cuter? Underwood used her two dogs, Ace and Penny, to help her make the pregnancy announcement. From social media posts to public displays of baby bumps, celebrities have a variety of ways they like to reveal pregnancies to us. Some like Naya Rivera like to be more blatantly obvious, while others like Keibler will make a clever joke. Be prepared for a future full of more entertaining announcements, baby pictures and cute celeb families that grow by the second. Photo sources: Pinterest.com, DailyMail.co.uk, TheHonestyHour.com, Celebrity.Yahoo.com, NYDailyNews.com, ECanadaNow.com.